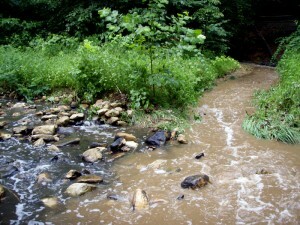 Donaldson Run watershed in north Arlington. Story maps were released in the fall of 2017 highlighting the before/after improvements from the Tributary A project and key elements of the Tributary B project. The storm sewer pipe and outfall at the end of N. Upton Street will be repaired as part of the project. Once the design for that portion of the project is complete, and minor updates to the stream restoration have been made to accommodate the outfall repair, the project will be at 100 percent design. Construction is expected in 2018. Hydraulic studies for Federal Emergency Management Agency permitting are completed. The easement process has been completed. The design is being finalized (near 100%) and includes construction access, future maintenance access, and modifications to three stormwater outfalls. Invasive plant treatments were conducted October 21-27, 2016. The planting plan (includes trees, shrubs and herbaceous plants) has been completed. 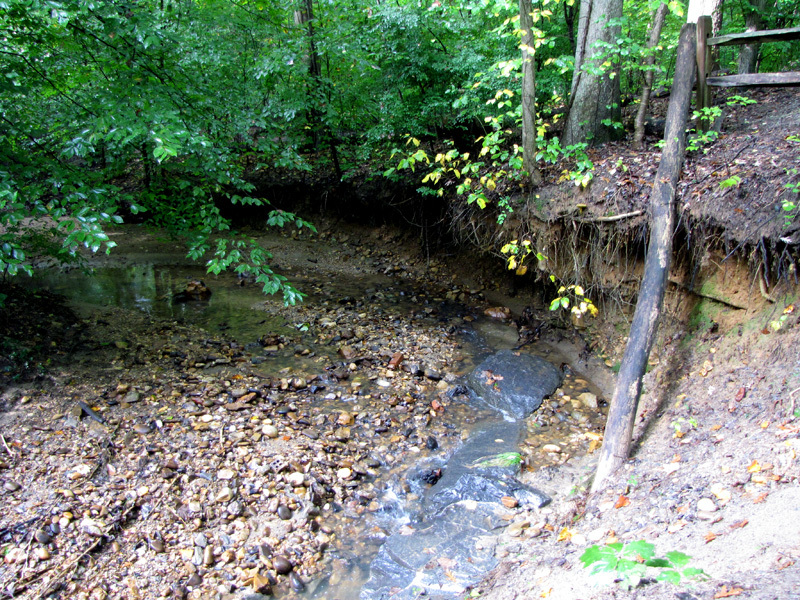 Donaldson Run has been impacted by stormwater runoff, causing excessive erosion along the stream channel. 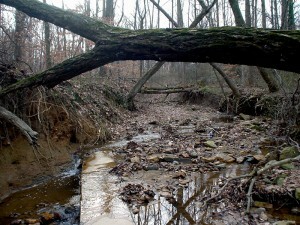 A technique called “natural stream channel design” will be used to create a new stream channel that’s in balance with the runoff it receives from the surrounding land. The stream will be raised up to reconnect it with the floodplain area. During higher flows, the stream can flow onto the floodplain and the water will slow down and reduce its energy. In addition, step pool structures and meanders will be added with rocks that help reduce the energy of the flow. 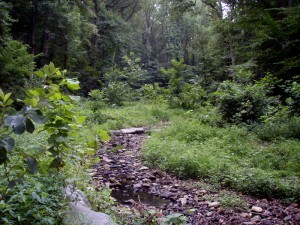 In 2006, the County completed a stream restoration of Donaldson Run’s Tributary A. The photos at the top right of this page show before and after pictures of the stream restoration. Help the County meet its regulatory requirements to reduce nitrogen, phosphorus and sediment pollution. The County’s MS4 Permit requires reductions in nitrogen, phosphorus and sediment pollution. Stream restoration projects, like Tributary B, are especially effective tools to address phosphorus and sediment pollution. Arlington’s pollution reduction efforts are a part of the larger Chesapeake Bay cleanup effort. Protect the 30” water main, sanitary sewer line, and an exposed sanitary sewer lateral. The water main within the stream valley serves roughly 20,000 residents. Erosion in the stream valley has uncovered the water main and the sanitary sewer line and lateral. This infrastructure was not designed to be exposed and as a result is currently more prone to damage and breaks. 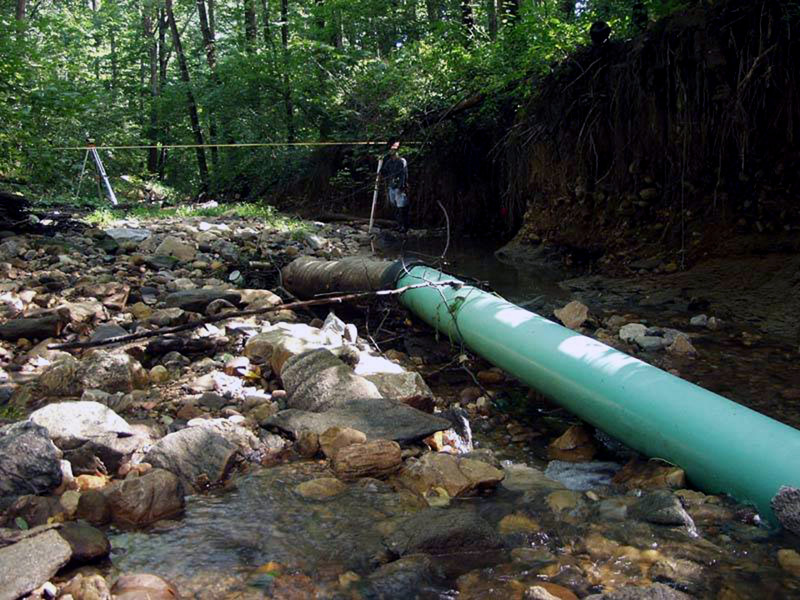 The project will support and protect these pipes. Improve the long-term health of the stream valley forest. 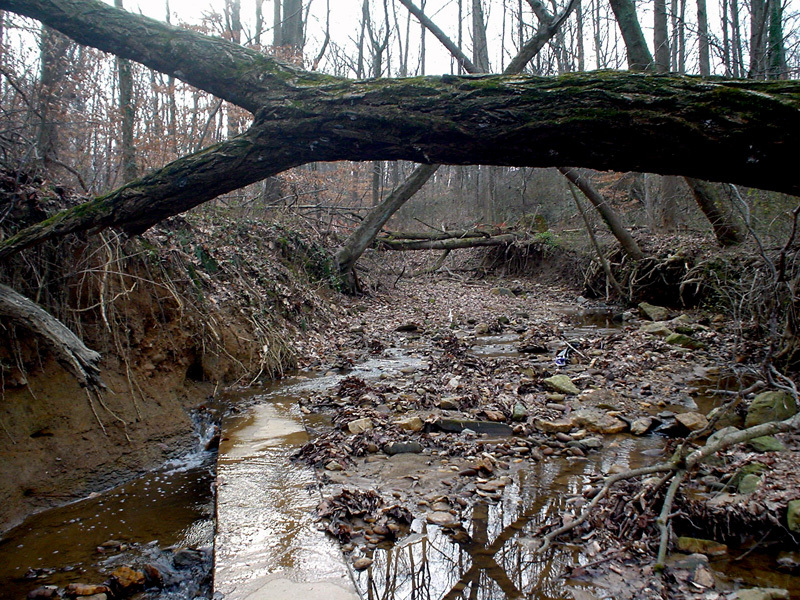 The stream erosion has caused mature trees to fall into the stream and more will likely fall in the coming years unless the stream valley is restored. The restored stream channel will be stable, and, as a result, the remaining trees and new trees planted after restoration will be protected. 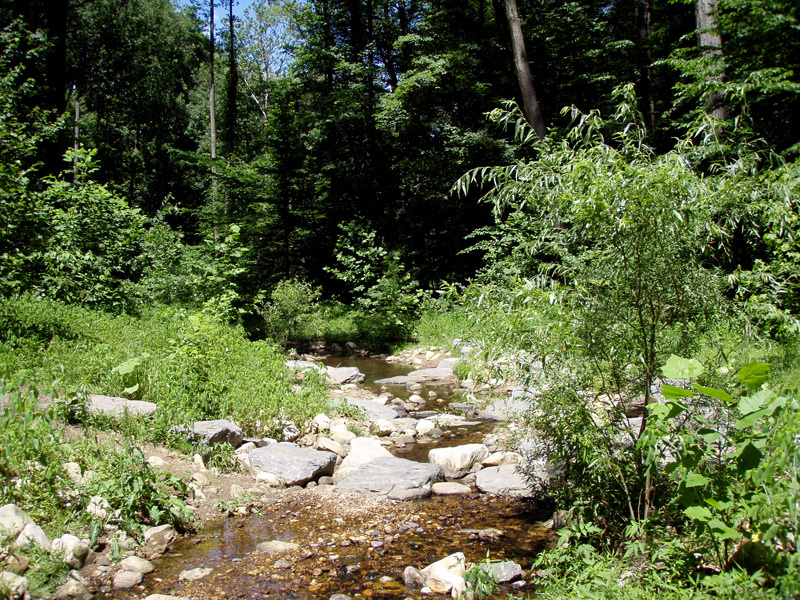 Restore native vegetation to the Tributary B stream valley. The area surrounding Tributary B is overrun with invasive, nonnative plants such as kudzu, porcelainberry, and English ivy. The area will be replanted with native plants that support local wildlife. Protect the multi-use trail. Erosion is threatening the trail in several places.This is particularly noticeable in the section that is close to the confluence with Tributary A. Design alternatives have been suggested to stabilize the stream in its current configuration. Learn why stabilizing the stream in its current configuration isn’t effective. Why doesn’t the County do stormwater management upstream of Donaldson Run to reduce stormwater runoff, instead of doing stream restoration? We’ve completed a study of all the areas in the County to find locations to add stormwater management facilities in local watersheds. These watershed retrofits will slow down and treat stormwater runoff, which will help water quality in our streams in the long term. However, these retrofits can’t undo the damage that development and excessive runoff have already caused to local streams. Streams that have eroded down and widened in their channel will continue to do so, washing more sediment and pollution downstream, and threatening more trees along the stream channel. Why do trees have to be removed to do a stream restoration project? Due to the extremely tight work area, the impact that heavy equipment will have on the critical root zone of nearby trees, and the fact that some of the trees are compromised due to stream bank erosion, some trees will be lost as a part of the construction process. Trees that are lost will be replaced following construction. Two tree inventories were completed for this project. The first in 2010 and the second in 2015. For each inventory, urban foresters surveyed, measured, and assessed the condition of all of the trees in the project area. 81 trees will be removed as a result of the project. 285 native trees and shrubs will be planted following the completion of the construction phase of this project. December 2007 Neighborhood Conservation (NC) Advisory Committee Meeting Funding approval. 2005 Donaldson Run Civic Association Votes taken to reaffirm the Tributary B stream restoration project as the neighborhood’s first-priority NC project. September 2004 Donaldson Run Civic Association Vote to designate the Tributary B project as the priority NC Program project (it was announced prior to the meeting that the vote would be taken). 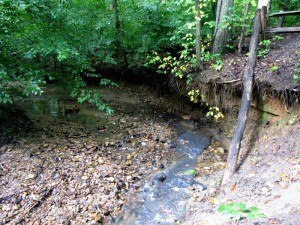 More than 10 years ago, residents of Donaldson Run Civic Association were concerned about erosion in the stream, which degrades the health of the stream and threatens nearby trees and trails. The Donaldson Run Civic Association applied for and received Neighborhood Conservation Program funding in 2001 to study Donaldson Run stream and identify potential stream improvements. 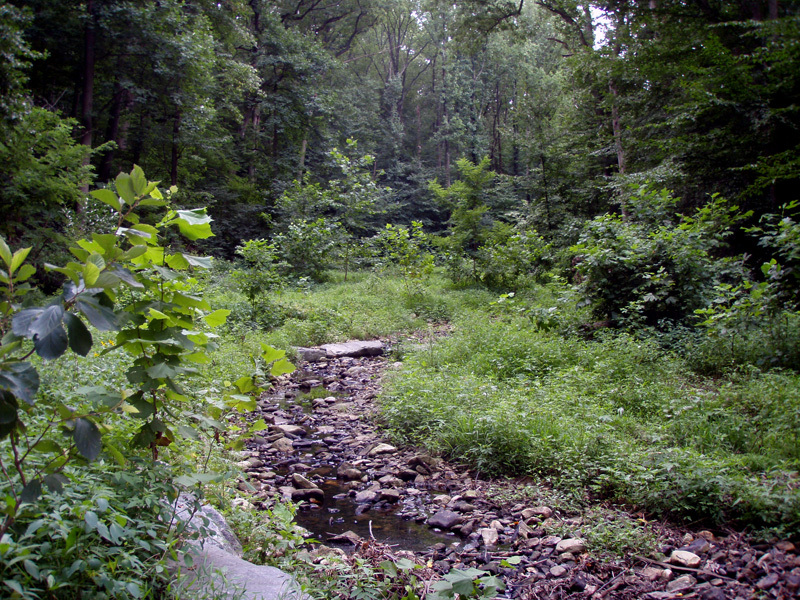 A stream restoration project was completed on Donaldson Run Tributary A in 2006. Before and after photos are in the image gallery. 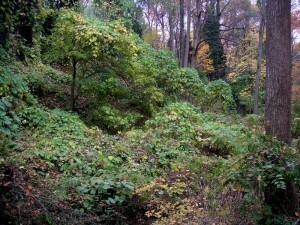 The Donaldson Run Civic Association was awarded an additional $350,000 in 2007 to restore Tributary B. Matching funds to construct the project will come from the Stormwater Fund.